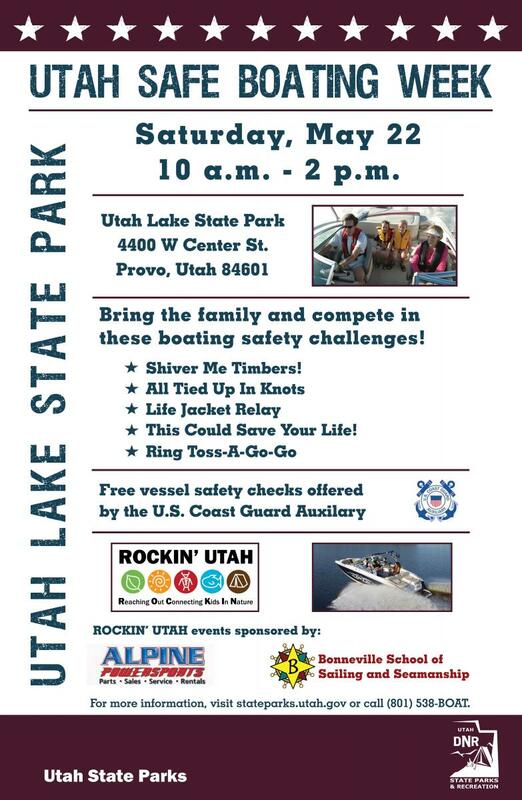 Provo – Join the Utah State Parks Boating Program Saturday, May 22 from 10 a.m. to 2 p.m. at Utah Lake State Park for a day of activities kicking off Utah Safe Boating Week. Events include boating safety challenges, games and free vessel safety checks by the U.S. Coast Guard Auxiliary. For more information, visit stateparks.utah.gov or call (801) 538-BOAT. Utah State Parks and the National Safe Boating Council also invite recreationists to join them Thursday, May 20 at 8:30 a.m. at Cabela’s in Lehi as Utah joins other states for Inflatable Life Jacket World Record Inflation Day. The Utah State Parks Boating Program will provide free cartridges to the public who participate and bring their own inflatable life jackets. Throughout North America, participants will simultaneously inflate their life jackets to set a world record. The National Safe Boating Council not only hopes to set a world record, but educate the boating public about the comfort and accessibility of inflatable life jackets. According to Utah Boating Program Assistant Manager Chris Haller, one Utahn lost his life this year by not wearing a life jacket. In 2009, seven Utahns who died in boating accidents would likely have lived had they worn life jackets. This World Record Day helps to usher in National Safe Boating Week May 22 to 28. The goal of National Safe Boating Week is to educate and inform the boating public about boating safety, specifically life jackets. Cabela’s is located at 2502 West Grand Terrace Parkway in Lehi, Utah. For more information, visit http://www.readysetinflate.com/ . For boating education and safety information, visit www.stateparks.utah.gov/boating or call 1-800-RIDE-PWC.